Virtual and augmented reality in archaeology revive Pompeii, Çatalhöyük. Archaeologists use virtual reality to explore long-gone worlds. 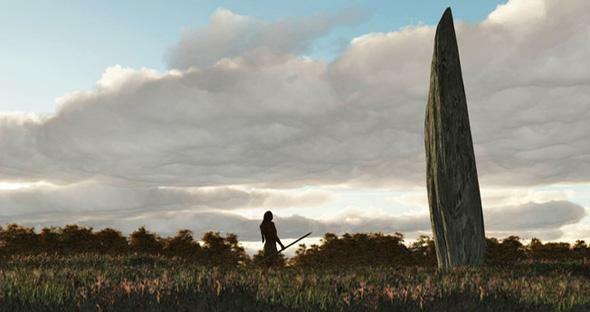 A screenshot from Michael Abbott’s Kickstarter project to create a virtual version of a Bronze Age village in Britain. Unfortunately, the Wendy’s I can see from my front porch serves as a daily reminder that there’s no going back. But who’s to say we can’t still pretend? And I don’t mean by smearing on war paint and hiding behind logs with a BB gun. (Though I encourage that, too.) I mean through a combination of archaeology and virtual/augmented reality (VR/AR). Kickstarter just funded a new project by Marcus Abbott that aims to combine topographical and scientific data in order to produce lifelike representations of a Bronze Age village in the United Kingdom. Which means that once it’s completed, you’ll be able to fly through hyper-real fens and bogs that closely mimic evidence archaeologists have gleaned from the area. Though I suppose if they truly wanted to make it a lifelike representation, they’d eliminate the “flying” option and make you slop around in the muck and come out covered in digital leeches. All the same, I think these sorts of projects are interesting because they provide us with experiences we couldn’t otherwise have. OK, that sounds obvious, but there are still many archaeological sites on Earth that you can experience for yourself. I’ve been to Machu Picchu and, I’m here to say, it’s a freaking trip. But Flag Fen, the proposed site for the VR Kickstarter? It’s little more than a pile of sticks. After Abbott’s 3-D modeling, however, Flag Fen will be partying like it’s 1499 … B.C. Of course, this isn’t the first intersection of archaeology and VR/AR. A few years ago, the volcano-flattened city of Pompeii made headlines thanks to a headset and a multidirectional treadmill that allowed visitors to take virtual tours. (Unfortunately, the project focuses on life before the cataclysm. I think I’d prefer an obstacle course version where you have to escape the volcanic apocalypse, all Indiana Jones-like—with apologies to the archaeologists who curse his name.) And it seems like every national park, museum, and monument can now be enhanced by apps for the smartphone or tablet. But enhanced tourism is only one angle here, and it may be the least interesting of the bunch. In fact, virtual reality may provide the opportunity to explore the ancient world in totally new ways, yielding insights we may not have discovered otherwise. For instance, when archaeologist Colleen L. Morgan wanted to reconstruct a Neolithic site in modern-day Turkey called Çatalhöyük, she turned to the online realm of Second Life. Equipped with only some basic digital construction tools, Morgan rebuilt Çatalhöyük brick by brick, which forced her to look at the site’s architecture in ways she’d never before considered. All of sudden, she was asking questions about wall textures and chimney hole alignment. And when she went back to the field, she started taking notes and pictures that would better serve her virtual reconstruction—in other words, she gathered data she wouldn’t have otherwise. I heard this kind of stuff again and again when talking with AR/VR archaeologists. Shawn Graham, an assistant professor of digital humanities at Canada’s Carleton University, started off with an interest in Roman archaeology and ancient social networks. But now he’s approaching both fields through simulation and gaming. Graham takes data he’s gathered about how different strata of Roman society used to jostle for rank à la House of Cards and programmed “a new population of artificial Romans” to follow a set of rules to understand how these power struggles might have affected the economy. And in some cases, it’s not just about seeing or touching. Professional archaeologist Stuart Eve created a multisensory augmented reality system called Dead Man’s Nose that uses a smartphone or tablet, GIS mapping, an Arduino microcontroller, and a range of scents to give walking tours an accompanying olfactory array. So when you stroll through the ruins of an ancient market or orchard, wafting scents of cooking meat or the blooms of local flora provide another level of immersion. One can assume we’d leave out some of the more common smells of the good old days, like body odor, open sewage, and the friendly neighborhood corpse cart. But hey, every representation of history is wrought with subjective interpretation. Of course, not everybody has the opportunity to go to such places, which is why virtual reality will always be valuable. Actually, preservationists would probably prefer most of us experience historical sites virtually, just as a trip to the Galapagos Islands via Google Street View is more sustainable than mucking up the place with your flippers. And let’s face it—the age of exploration is mostly over. Most of us don’t have the time, money, or expertise for deep-sea dives or interplanetary space missions, and AR/VR in all its forms offers us experiences we simply wouldn’t have access to otherwise. But even these brave new digital worlds are no more permanent than the civilizations they’re modeled after. When Second Life raised the cost of its educational subscription rates, Morgan chose to bequest her beloved Çatalhöyük to the online hordes. More from Slate’s series on the future of exploration: Is the ocean the real final frontier, or is manned sea exploration dead? Why are the best meteorites found in Antarctica? Can humans reproduce on interstellar journeys? Why are we still looking for Atlantis? Why do we celebrate the discovery of new species but keep destroying their homes? Who will win the race to claim the melting Arctic—conservationists or profiteers? Why don’t travelers ditch Yelp and Google in favor of wandering? What can exploring Google’s Ngram Viewer teach us about history? Why did some of America’s best scientific minds gather in 1961 to discuss extraterrestrial life?